For the similarly named university in Indiana, United States, see Vincennes University. 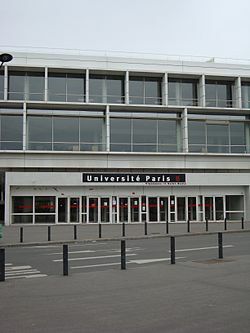 The University of Paris VIII or University of Vincennes in Saint-Denis (French: Université Paris 8 Vincennes-Saint-Denis or Université de Vincennes à Saint-Denis) is a public university in Paris. Once part of the federal University of Paris system, it is now an autonomous public institution and is part of the Université Paris Lumières. Most undergraduate degrees (except modern languages) are taught in French. It is one of the thirteen successors of the world's second oldest academic institution, the University of Paris, and was established shortly before the latter officially ceased to exist on 31 December 1970. It was founded as a direct response to events of May 1968. This response was twofold: it was sympathetic to students' demands for more freedom, but also represented the movement of students out of central Paris, especially the Latin Quarter, where the street fighting of 1968 had taken place. Founded in 1969, the new experimental institution was named Centre Universitaire Expérimental de Vincennes (CUEV) in Vincennes. In 1971, it gained full university status, thus allowing it to award its own degrees, and renamed "Université Paris VIII". Since moving to Saint-Denis in 1980, the university has become a major teaching and research centre for humanities in the Île-de-France region. As soon as it opened, Vincennes became the venue for a continuation of 1968, being occupied almost immediately by student radicals, and being the scene of violent confrontations with the police. One incident, in early 1972, involved a janitors' (travailleurs du nettoyage) strike. The radicalized janitors invaded classrooms, accused the professors of being scabs, and demanded solidarite. Meanwhile, there was so much radical leafleting, some university hallways were clogged with ankle-deep crumpled leaflets. Since the turmoil in the late 1960s, the University has endorsed a far more mainstream academic life and has brought in new departments, new professors, and national rules to effect this change. In 1980, the University was relocated to the suburb of Saint-Denis. The University's capacity of 24,000 students per year makes "Paris VIII" an important university with internationally recognized departments in Philosophy, Political Sciences, Cinema Arts, Communication Studies, and Feminist Studies. The university offers over a hundred undergraduate, graduate and diploma courses. It is particularly well known for its political science programme as it is the only public university in France to offer this subject at undergraduate level. The University of Paris VIII also offers some distance-learning opportunities for a select number of subjects such as Law and Psychology. Paris-VIII is exceptionally well-connected and enjoys over 250 partnerships with universities around the world. They include the UC Berkeley, the Beijing Film Academy, Boston University, the Free University of Berlin, the Humboldt University of Berlin, the University of Vienna as well as since 2016 the University of Rojava. Students are encouraged to spend one or two semesters at a neighbouring institution in the US, Canada, Latin America, Asia or Europe in order to develop their language skills and cultural understanding. Alternatively, students also have the possibility to teach French in a high school abroad or to complete an internship. ^ "Info" (PDF). www.letudiant.fr. 2013. ^ "Paris VIII: History". www.univ-paris8.fr. ^ "Paris VIII: Educational Programmes". www.univ-paris8.fr. ^ "Rojava university seeks to eliminate constraints on education in Syria's Kurdish region". ARA News. 2016-08-15. Retrieved 2016-08-15. This page was last edited on 8 January 2019, at 09:43 (UTC).